The Siberian Husky is a thick coated and compact sled dog. It is a medium sized dog and has strong endurance, it belongs to the working group. Also known as the snow dogs, they have been raised to work in packs and to pull light loads over snow laden areas. The Huskies are friendly, appear majestic and finicky. The Huskies were primarily a sled pulling dog for centuries in the harsh region of the Siberian Tundra. They came to America during the 1900s and became one of the most popular breeds among the Alaskan dog mushers. The Husky is a fine sled dog as they are smaller and faster than the Alaskan Malamute. They are also highly capable of covering great distances and at higher speeds. The sibs are very friendly and outgoing. Definitely not a trait we would appreciate in a watch dog or a guard dog. They are very independent and love to roam. The sibs rarely bark but engage in communal howling. As they are pack animals, they prefer the company of other dogs and people and tend to view smaller dogs or cats as prey. The medium sized Husky have almond shaped eyes that can be either blue or brown in colour. Sometimes their eyes can be of two different colours. The male huskies weigh between 45 and 60 pounds and the females weigh between 35 and 50 pounds. Rather than appearing tall the Huskies are long. The Sibs have a thick double coat of medium length hair. They shed heavily throughout the year and blow their entire coat twice a year. Huskies come in different colours and patterns. But they usually have white paws, faces, legs and tail tips. 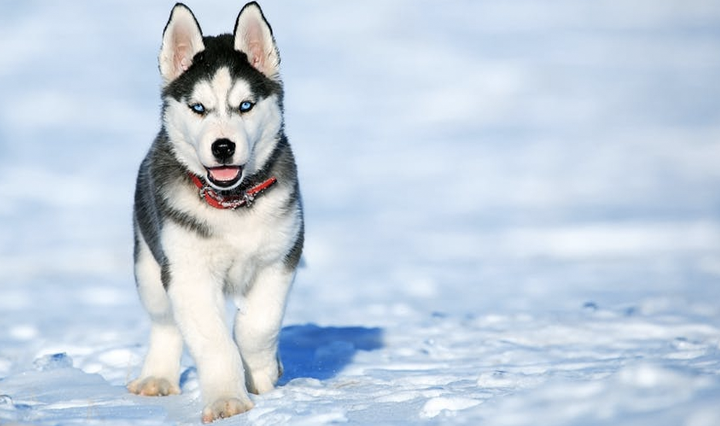 The most commonly seen husky colours are black and white, grey and white, copper and white or total white. The Huskies are very friendly family dogs who are not possessive like guard dogs or are wary and aggressive with strangers or other dogs as is seen in watch dogs. Their wolf like appearance make them very attractive and so is their even temperament. Their friendly nature and love for other dogs and their unsuspicious nature towards strangers make them an ideal family dog. But, in order to maintain their friendliness and good behaviour the huskies need regular exercise and extensive training. People who have the time, resources and commitment to do it should have this breed. The Sibs need plenty of physical activities to maintain their health. Since they were developed as sled dogs, they have tremendous level of endurance and lots of surplus energy. This means that if you bring home a Husky you are automatically registering yourself to an active lifestyle. Huskies enjoy long walks, hikes, bike rides and jogs. They love playing frisbee and can play catch and fetch for hours. The medium sized husky breed may look attractive for people living in apartments, but such setting does not suit them as they may get more mischievous and riotous when they enter adulthood and will need plenty of space to roam around. The Sibs may do very well in obedience class and come home and ignore everything they have learnt. So, this breed is vey difficult to train and can be quite a handful for first time pet parents. Huskies require gentle and firm handling by those who have leadership qualities and are able to be consistent in terms of establishing boundaries and enforcing rules. All members of the family must be similarly trained to be consistent with the house rules and not to give in to the deceptively innocent and soft eyes of the husky! Yes, they can be quite good actors. The bottom rule is to not allow them to rule over the house and to get them to obey to the rules and you have the perfect dog. Huskies are very good escape artists. They can foil fences, screen doors, garages and other protective devices. So, remember to never leave your Husky unsupervised at home and are safely inside when you leave them alone for a couple of hours. This high spirited, mischievous and energetic dog can be quite a challenge to inexperienced pet parents. So, ensure that you have them trained at an early age and establish rules at home. ← Can dogs eat sardines?